The multi account access function within Neat’s SaaS offering makes it possible for an individual user to access an unlimited number of Neat accounts using a single set of logon credentials through the web portal interface. This is meant to support accounting and bookkeeping firms who manage mutliple clients using Neat and or individuals managing multiple businesses. The account access allows you to easily switch between the various accounts they have been granted access to by the respective account administrators (owners). As an accounting or bookkeeping firm, you will use the multi account access feature to set up, manage and collaborate with an unlimited number of clients. 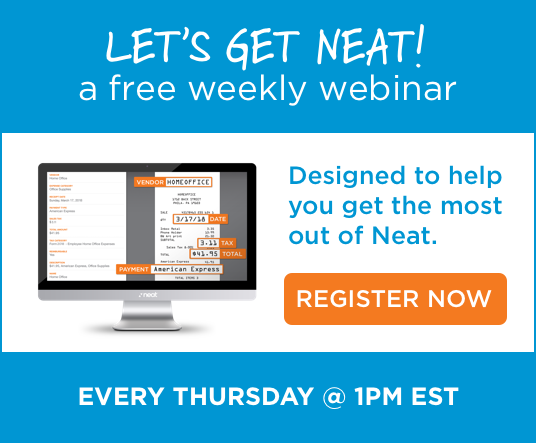 From processing incoming receipts, expenses and invoices to sharing documents and folders and reports with each other, Neat will help you win and retain more clients. That’s Neat!